FiddleStone Loops are fun and elegant loop pendant necklaces which have been designed to combine some practicality with sophisticated style. They are jewelry which has been designed with extra strength and durability, with special attention to textures while balancing colors and shape for pleasing style that can be worn both in casual and formal moods. These loops have a simple energizing quality to them which make them fun and soothing to fiddle with, like worry stones. These pieces incorporate a design that distributes the tension that exploring fingers might place on a necklace (they are designed to withstand a tug of 48 pounds! 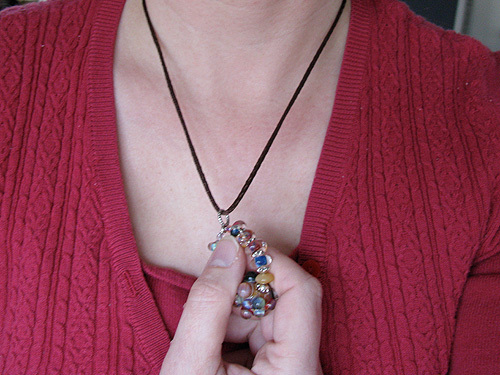 ), with a pendant that can slide around on the cord from which it hangs. This serves both to alleviate some of the pressure a tug on the loop can place on your neck as well as provide some calming activity for fidgety fingers. I originally designed the loop and sliding pendant style when coming up with a nursing necklace for my then infant daughter, but my youngest is now 4 and well past the yanking stage, and I fell in love with the loops and their durability because I find them very comfortable to wear, and I find myself fiddling with them quite often out of habit. These necklaces are designed to be a lovely addition to your everyday wardrobe, with the added benefits of durability and comfort as well. Please note: FiddleStone Loops are created primarily as lovely, one-of-a-kind, artisan jewelry intended for adults - and just like any other jewelry, should not be used as teethers or toys, nor should an infant or toddler be left alone with these or any other necklaces, as the beads are a choking hazard and the cord is a strangulation hazard. They are designed to be stronger than most necklaces, so that tugging and yanking won't snap them easily, but the beads are glass and gemstones, not plastic, and they have not been designed to be used by children. Please use common sense with your jewelry. Each pendant is strung according to the customer's desired length at the time of purchase. This is to remove the need for extensions, which will make the necklace less sturdy. My necklaces are not adjustable - so far I have found that most necklaces of this kind that claim to be "adjustable" turn out to be hanging from a cord with a slip-knot tied on the end - I use large easy to use lobster claw clasps on my work. My pieces have several tension points and many of the pendants are designed to slide around on the cord to keep some of the tension down. Because of this, I ask that when you order a necklace from me, please let me know how low you'd like the loop to hang so I can adjust the length of the cord.